My mom visited last week and we went on a whirlwind tour of favorite markets — Whole Foods, Market Street, Trader Joe’s and finally, Central Market. (Karen, you should have been here!) The highlight of the outing was meeting the Texas Toffee Queen, Nancy Lalumia, offering samples of her handmade toffee at Central Market. We had already tried Nancy’s Dark Chocolate Espresso Toffee, and I was anxious to try some other flavors. The milk chocolate toffee was a traditional classic with smooth chocolate atop buttery toffee with a perfect consistency. Dark Chocolate Salted Jalapeño was a winner in Zest Fest’s “Zesty Sweets, Candy & Chocolate” Category and we definitely agreed with the judges’ decision! If you have followed our blog for long, you know I have a weakness for chocolate combined with salt or peppery heat. Having all three combined knocked me out! I knew I would probably be the only one in the house who would truly love the spicy treat, so I selected the decadent dark chocolate toffee to share. It was such a pleasure to meet Nancy and hear first-hand her passion for making toffee. We shared a laugh at the thought of toffee being “healthy”, but Nancy has developed her recipes to be “healthier”. Choosing all-natural ingredients, like real butter, is the first healthy step. Rather than simply having a light dusting of finely chopped nuts sprinkled across the top of her toffee, Nancy balances a generous measure of freshly roasted almonds with sugar in the toffee base. Corn syrup is the normal binding agent used in toffee, but Nancy uses the absolute minimum amount necessary. The result is a delicious, nutty toffee base that avoids the “sugar bomb” effect of some toffees. Finally, Nancy finishes her toffee with the finest quality chocolate, and additional chopped almonds. Since dark chocolate has antioxidants that may prevent heart disease, and may help lower blood pressure, it’s another healthy choice (in moderation, as I keep reminding myself). 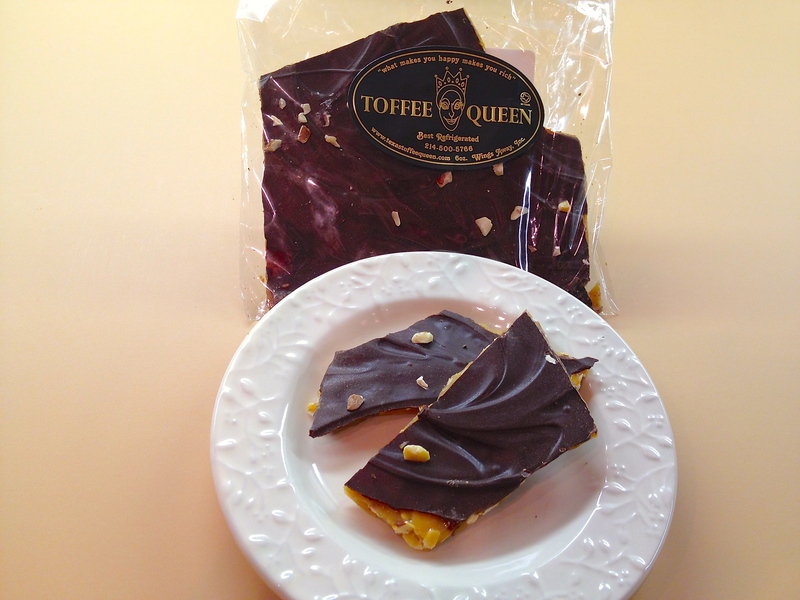 Texas Toffee Queen’s candy is easy to love and hard to resist! We have had some really strange weather in the past few weeks, and have set several low temperature records. In many ways, it hasn’t seemed much like spring, but cooler temperatures haven’t kept me from craving ice cream. 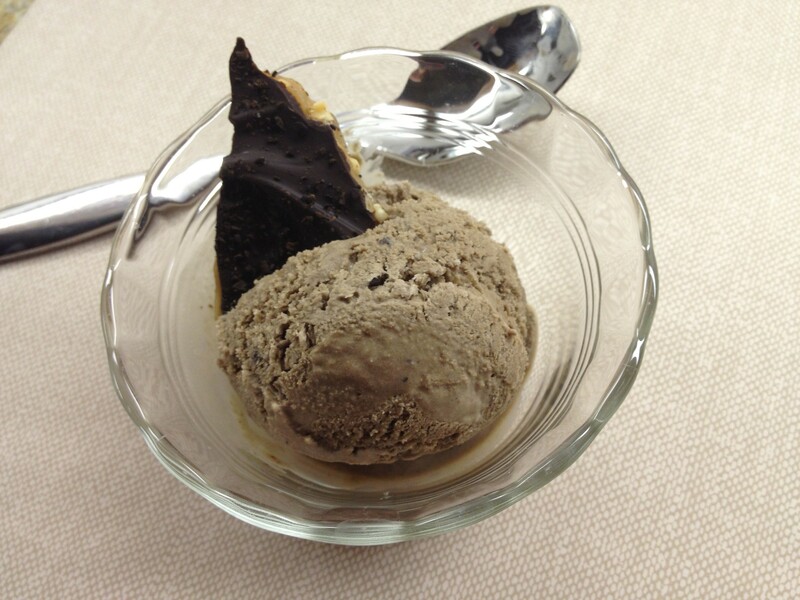 King Arthur’s website whetted my appetite with a recipe for Mocha Madness Ice Cream. I pretty much became an instant lover of all things mocha when I finally decided to become a coffee drinker several years ago. I eased myself into it by mixing a tablespoon of hot chocolate mix into my coffee, so now, any recipe with coffee and chocolate gets a second look. There was one ingredient in the mocha ice cream recipe that didn’t wow me – a mix-in of Oreo cookies. 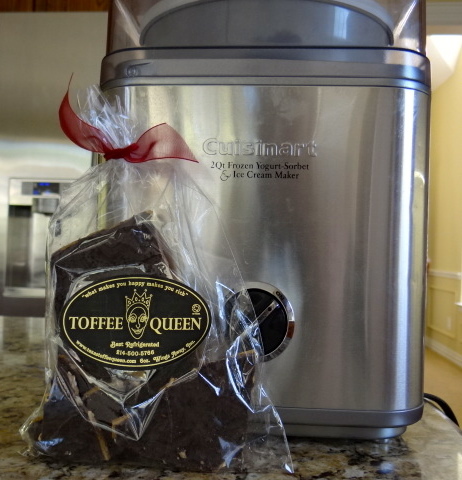 I set the recipe aside while I considered other mix-in options, and inspiration struck very soon when I saw Texas Toffee Queen Dark Chocolate Espresso toffee at Central Market. Yeah, that would be about a 200% upgrade from Oreos! The package label indicated the toffee needed to be refrigerated and could be frozen, so that sealed the deal. Of course, taste-testing the toffee was the first order of business. The rich, buttery toffee topped with creamy dark chocolate, and dusted with espresso powder was wonderful. The toffee layer avoided the often fatal flaws of being extremely sticky or hard as granite. It was full-speed ahead to ice cream! Whisk together the milk, sugar, espresso power and cocoa until well blended. Stir in the heavy cream and vanilla. Freeze according to the manufacturer’s directions for your ice cream freezer. Add toffee pieces during the last 5 minutes of processing. Transfer the ice cream to an airtight freezer container and freeze for another 2-4 hours, or until it is the desired consistency. Nancy Lalumia, the Texas Toffee Queen, comes from a family well-experienced in the food service business, and she was involved in family restaurants for a number of years. 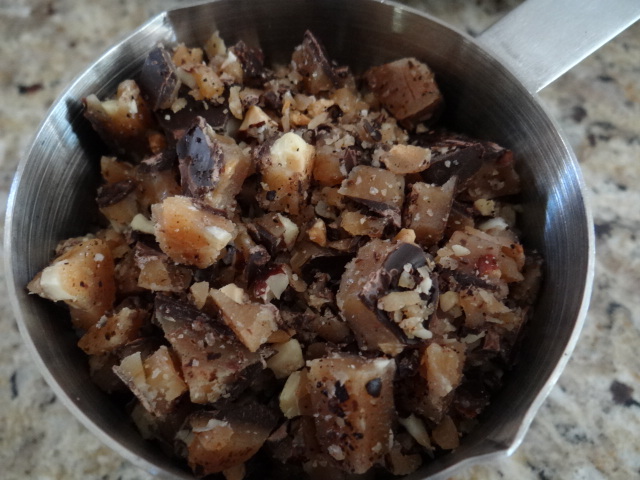 Nancy has always loved English toffee, and she made it for friends and family at Christmas. Her sister-in-law suggested Nancy bring some of the toffee to the gourmet food shop she and her brother owned. It quickly sold out and Nancy had a special order from Dallas Independent School District, so she made a very quick leap into the toffee business. Her core flavors are dark chocolate, milk chocolate, and white chocolate cranberry, but she also has prize-winning spicy varieties: white chocolate mango chili, dark chocolate salted jalapeño, and white chocolate peach ginger habanero. Wow, those all sound amazing! Now is certainly the time to order some of Nancy’s delicious toffee, because the Texas heat makes shipping a no-go from June through October. Read more of Nancy’s story and check out all the delicious flavors on her website.